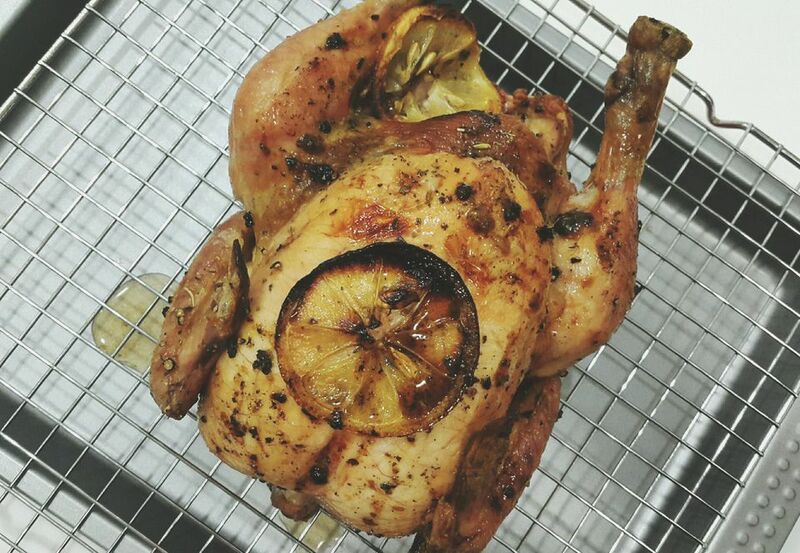 This beer can chicken has a fantastic garlic and lemon flavor. Remember, you can use the beer can or you can use a glass jar to hold the liquid. In either case the jar or can needs to remain at least 1/3 full. Wash and remove giblets and the neck (if applicable), from chicken. Pat dry inside and out with paper towels. Rub chicken with half of the garlic, half of lemon, and olive oil. Apply a portion of the rub onto chicken inside and out. Make sure to get some of the rub under the breast skin. This will help to flavor the breast meat. Open the can of beer and discard half of it. Place remaining rub into the can and gently swirl a few times to combine. Make sure to pierce two more holes on the top of the beer can to release steam during the cooking process. Place chicken on top of can making sure it is well supported. Place onto grill balanced by the beer can. Grill over indirect medium heat for 2 hours, or until internal temperature of thigh is 180 degrees F/82 degrees C.
Remove chicken (using heat resistant gloves) when finished cooking and let sit with the beer can still intact, for 10 minutes before carving. Gently remove beer can and discard. Most people make 2-3 birds at a time. Simply double or triple the recipe based on how many chickens will be used and follow the instructions as listed above.